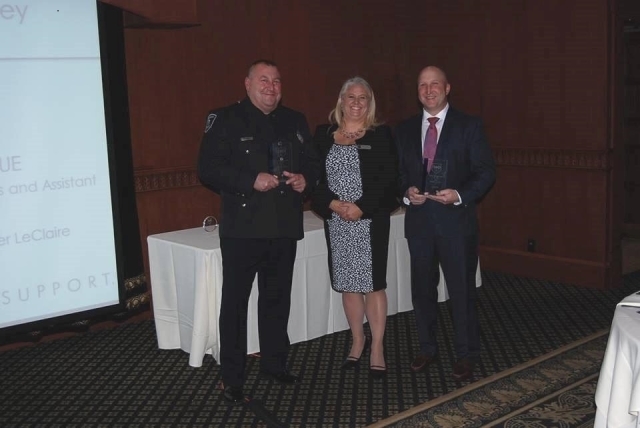 Dan Brown and Jim Velonis received The 2015 Chief Michael Maloney Award this past November at a ceremony in North Hampton. They were fortunate to be at the right place and time to save a young 15 y/o kayaker that was drowning in the Plum Island River last August. It was a cumulative effort between both the Newbury Police/Harbormaster and Fire departments. We are pleased to officially announce the awarding of a Port Security Grant to the Massachusetts Harbormaster Association of which we, the North Shore harbormasters, are very active members. This grant is a huge boost to all our harbors/waterfronts and we look forward to meeting with you in October to determine the security needs of your communities. A notice will be sent as to the place and time of that meeting. We encourage you to share the attached notice with your town officials and local newspapers. Or let us know if you have a local newspaper or social media that you would like us to contact and we will send along this notice. Peter is more than willing to answer questions and also notify your local newspapers etc to get the grant notice out to your cities and towns. 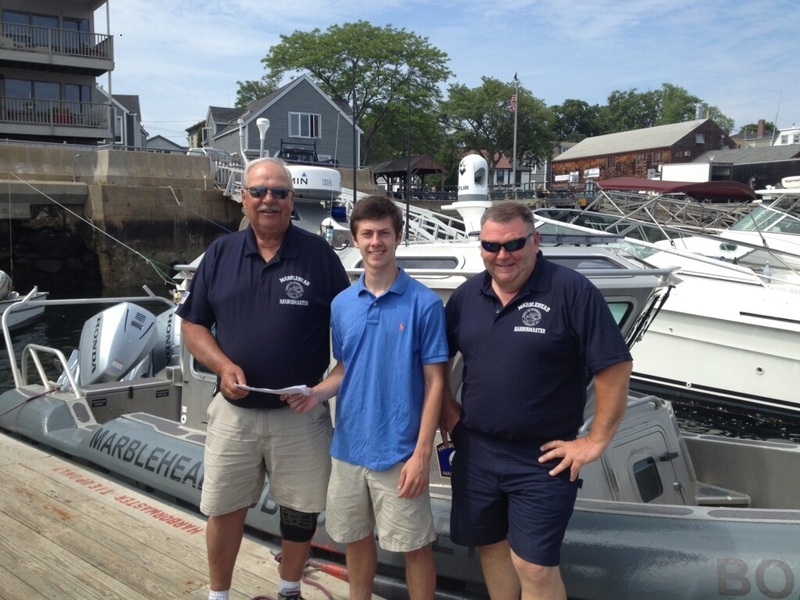 2015 Scholarship winner Elliot Smith, Marblehead High School. To his right is Ray Gauthier, a member of the Marblehead Harbor Department, and to his left is F. Webb Russell, Marblehead Harbormaster. The Massachusetts Harbormasters Association, North Shore Chapter, is pleased to announce that again this year, we will be awarding a scholarship in the amount of $1,000.00. Due to the involvement of your community’s Harbormaster Department with our association, a senior student at your school may be eligible for this scholarship. Please inform potential applicants in your graduating student body about the availability of this scholarship and furnish interested individuals with a copy of the enclosed application. We also ask that you let them know that this scholarship is available only to students pursuing a program of higher education in Marine or Environmental related fields. Applications must be received by May 15th, 2015 in order to qualify. 2014 Scholarship winner Gianna Famolare of Winthrop. Also in picture Scott Story, president NSHM and Ray Gauthier chairman NSHM Scholarship committee. Gianna will be entering her freshman year at Villanova college. 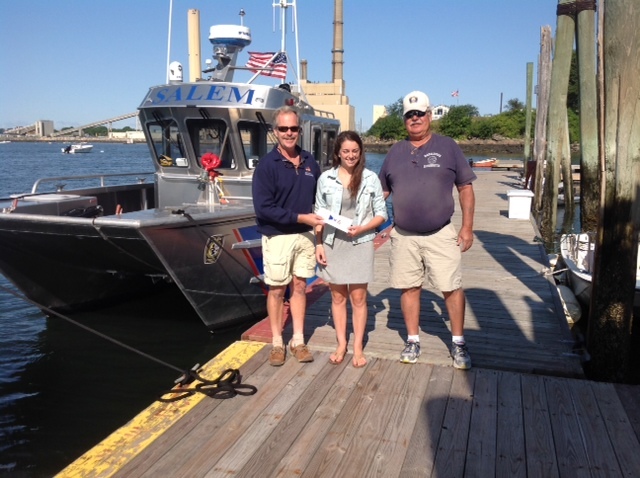 Photo taken at the Salem Harbormaster dock. Applications must be received by May 16th, 2014 in order to qualify. The North Shore Harbormasters’ Annual Meeting will be held on March 3, 2014 beginning at 6:30pm. Meeting will be held at USCG Station Gloucester, Harbor Loop, Gloucester, Massachusetts. Short business meeting, invited guest, vendor presentations & booths, lunch provided by association. Ample parking on water side of the Black Falcon Pier. The Massachusetts Environmental Police and the Gloucester Harbormaster will offer a Boat Massachusetts boating basics course March 25-27 and April 1-2, 6:30 to 8:30 p.m. at Gloucester High School, 32 Leslie O. Johnson Road. Participants must attend all dates. Registration is required; call 978-282-3012.